1921, Cast Bronze, Satirical medal, 60.0mm, 72gr. Obverse: "Pretense" is inscription on obverse-top. Inscription on door "Netherland Tax office". Inscription on sign to the lower right "A poor man I am, please." Words coming out of his mouth "I only have 1-1/2 million guilders." 1921. Reverse: Depicts the continuation of the obverse's "Pretense" by saying "and Actuality." 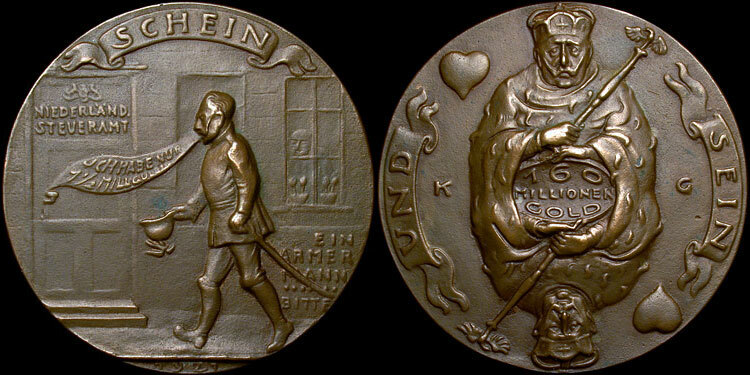 Kaiser shown as king of hearts with the figure "160 million in gold" displayed prominently in the center of double figure. One of Goetz' 'Kaiser' sub-set satiricals. Goetz cut him no slack after the Kaiser skulked his way across the border into the Netherlands.